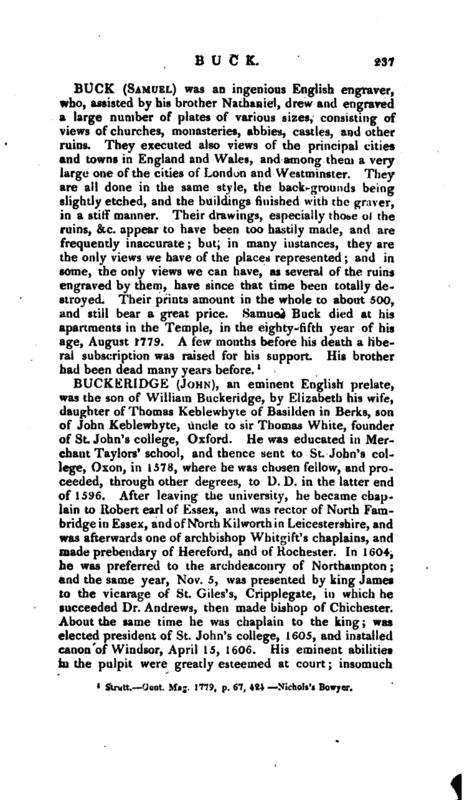 , an eminent English prelate, was the son of William Buckeridge, by Elizabeth his wife, daughter of Thomas Keblewhyte of Basilden in Berks, son of John Keblewhyte, uncle to sir Thomas White, founder of St. John’s college, Oxford. He was educated in Merchant Taylors’ school, and thence sent to St. John’s college, Oxon, in 1578, where he was chosen fellow, and proceeded, through other degrees, to D. D. in the latter end of 1596. After leaving the university, he became chaplain to Robert earl of Essex, and was rector of North Fambridge in Essex, and of North Kiiworth in Leicestershire, and was afterwards one of archbishop Whitgii’t’s chaplains, and made prebendary of Hereford, and of Rochester. In 1604, he was preferred to the archdeaconry of Northampton; and the same year, Nov. 5, was presented by king James to the vicarage of St. Giles’s, Cripplegate, in which he succeeded Dr. Andrews, then made bishop of Chichester. About the same time he was chaplain to the king; was elected president of St. John’s college, 1605, and installed canon of Windsor, April 15, 1606. His eminent abilities in the pulpit were greatly esteemed at court; insomuch | that he was chosen to be one of the four (Dr. Andrews, bishop of Chichester, Dr. Barlow of Rochester, and Dr. John King, dean of Christ-church, Oxford, being the other three) who were appointed to preach before the king at Hampton-court in September 1606, in order to bring the two Melvins and other presbyterians of Scotland to a right understanding of the church of England. He took his text out of Romans xiii. 1. and managed the discourse (as archbishop Spotswood, who was present, relates), both soundly and learnedly, to the satisfaction of all the hearers, only it grieved the Scotch ministers to hear the pope and presbytery so often equalled in their opposition to sovereign princes. Ath. Ox. vol. I.—Bentham’s Ely.—Spotswood’s Hist. 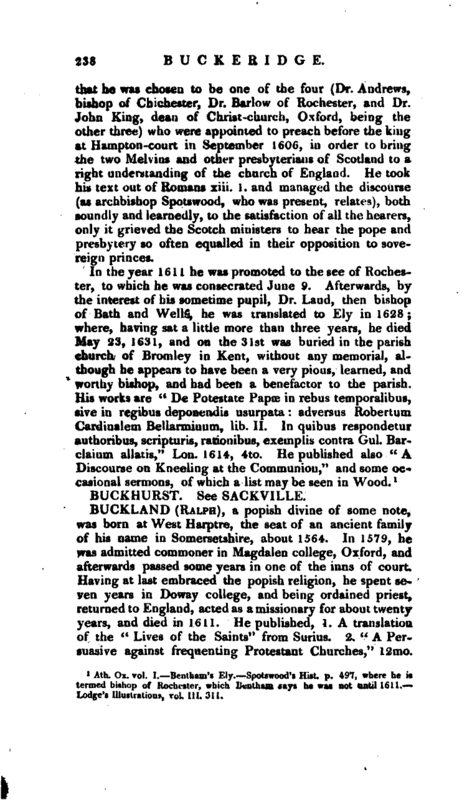 p. 497, where he is termed bishop of Rochester, which Bentham says he was not until 1611.— Lodge’s Illustrations, voL. III. 311.